It's blueberry season here in our neck of the woods and what a yummy season that can be. Blueberry jam will be making an appearance soon. As will blueberry pancakes and blueberry cobbler. Today however, I'm going to share with you a recipe that my friend Rachel pointed me to through Pinterest. It was delicious and was not overly sweet. 1. Arrange 1/2 of the bread cubes in a greased 9 x 13 pan. 2. Sprinkle cream cheese cubes and blueberries evenly over the bread cubes. 3. Top with remaining bread cubes. 4. Mix together eggs, milk, and syrup. 5. Pour over bread cubes and cover pan with foil. Let chill in refrigerator overnight. 6. Bake covered with foil at 350 degrees for 30 minutes. Remove the foil and bake for another 30 minutes or until fluffy and golden. Top with sauce. Serves 8. Sauce: Cook water, sugar, and cornstarch until thickened. Stir in blueberries and simmer for 10 minutes. Add butter and stir until melted. Serve over the french toast. Just to note, I used sour dough and loved the combination of the sweetness and the tartness together. I also didn't make the sauce, I just served with a tiny bit of real maple syrup. That looks delicious! It's nice to have something to just pop in the oven in the morning. 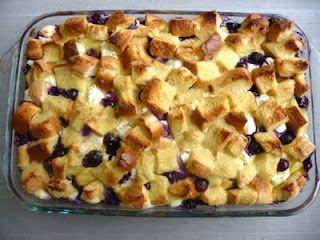 =D Way to use those blueberries! This sounds great Chas thanks for sharing it. We still have another month to go till Blueberry picking here in our neck of the woods, as we are just entering Strawberry season. But I can't wait to try this one. Have a great Day! Sounds delicious! We've got a local Upick blueberry farm just down the road and came home with buckets of berries. I've stashed most in the freezer, but if I decide to go back for round 2 and get a few more fresh for eating, I may need to give this a try! Thanks for sharing. this sounds and looks delicious. perfect for brunch! the july giftaway - is on! an anthropologie pillow and some goodies! enter and pass along! Dearest Chas, Love the quote at the top of the page. Very True. I will try your blueberry french toast. Thank you for the recipe. Sounds and looks YUMMY! I pray all is well with your family. This sounds delicious! I could definitely use more recipes in my arsenal that use up a dozen eggs. ;) Thanks for sharing! Favorite Things Friday: Books and a Giveaway!